To support fabrication of composite aircraft wings, Bombardier Aerospace, Belfast is using overhead cranes from Street Crane Company. There are three cranes of 5t safe working load. Two are of 20m span between the crane rails and one of 25m span. Crane rails are an integral part of the roof structure, rather than being attached to building columns or supported on gantries. 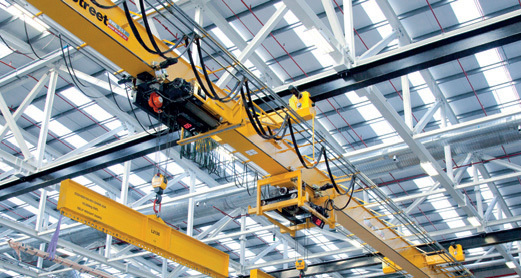 Each of the cranes has cantilevered extensions to the crane beam to give extended reach. This necessitated that crane construction be underslung from the tracks, and hoists in turn underslung from the crane bridge. The result is a compact crane that operates in a confined height envelope with the ability to traverse the load beyond the track line.